Toofan became really thin after a fight with a stray cat and his health had deteriorated at that time. Here is sitting in a meditative state in our kitchen. Pets have a unique way of building relationships with people. Like dogs are faithful to their masters, cats never forget their house number. We human beings often wonder how can a cat remember the house even after it refuses to become completely domestic. Since I was in school my experience with cats have been quite so fascinating since one of these animals was my constant company for more than five years. Like puppies, kitten too love to play with us but their hidden claws to catch prey are something one should careful about. In Bengali there is a saying that cats are "Bagher mashi", which means they are linked to the tiger family and the the proverb is true in every sense. They quietly proceed towards their prey-- a mouse is their favourite hunt -- and pounce upon it. They don't kill the prey but waits for it to die holding it under it claws like a winner. After that the cat enjoys playing with the prey to check if it has actually a successful hunt. Now he looks happy having finished his operation. I had the opportunity to watch my pet's antics since Panchu, my pet cat, came to me when he was barely a year old. Initially I had named him Pancham. But his nick name became more popular and my parents too adored him. A pet cat can be a neighbour's envy since they enter our door like a guest making their presence clear to everyone by a typical sound which only his owner can identify with. They not only don't meow but also modulate their voice according to their requirements. Our cat used to get scared by any kind of noise but listened to music with his eyes closed when I used to play the music system. He loved fish, milk and bread other than sandesh, a sweetmeat. Unfortunately is no more alive. At the middle of the night it used to come through a window and we never felt trouble since it had become a part and parcel of our life. Since then many years have passed and after almost six years one more cat had joined our family and we had named him Toofan and he had a brother, Baggu. The brothers were fed by my mother and me in turns. Like two human beings, my cats were also very different in nature. One like to sit quietly near the kitchen door while the other stayed out. In course of time, Baggu disappeared but Toofan continued to visit our house for food and love. They are grown-ups now and stay away from home. 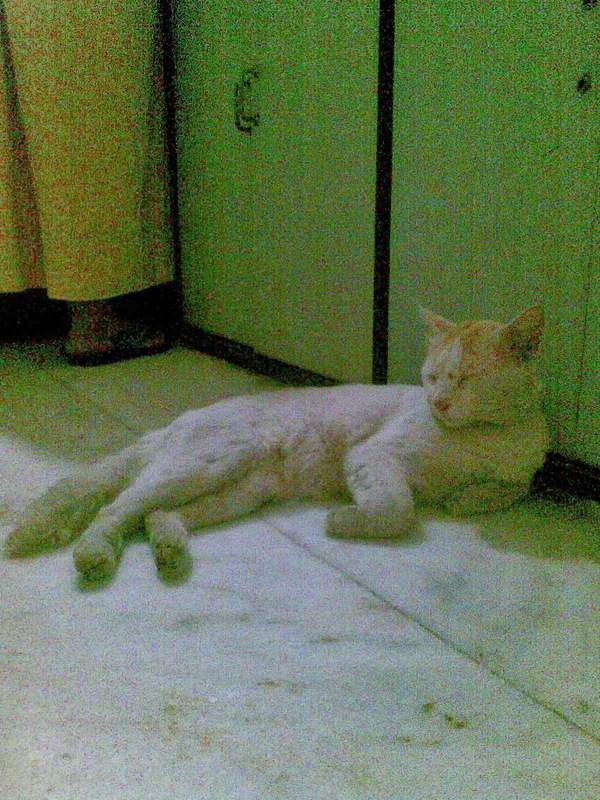 Once in a while other cats walk over the boundary wall of our flat and pause to take rest. I never miss a chance to feed one of those who suddenly take this way. There is immense happiness in giving some bread and milk to these small little animals.